Your Chance to RockYourWorkflow for only $39! 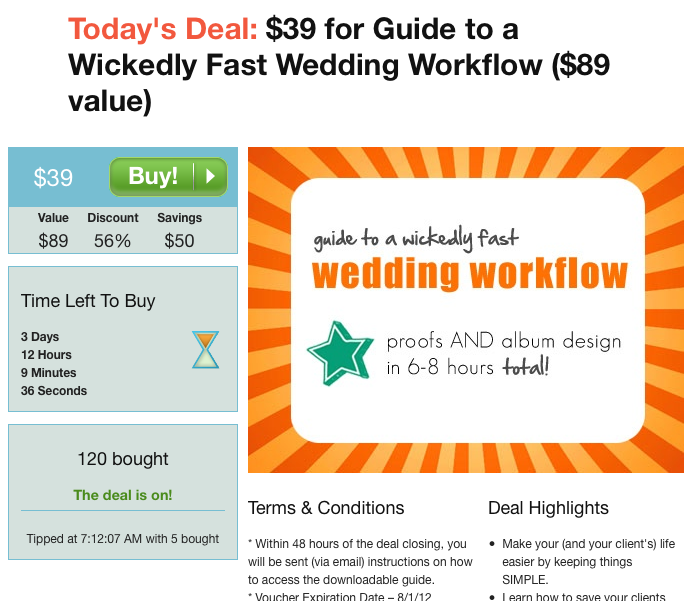 My Guide to a Wickedly Fast Workflow has been flying off the shelves our server since I launched it last January. If you've been waiting to get your hands on a copy, now is a great time! For a limited time, it's available for only $39 (regularly $89) courtesy of the folks over at PhotoDough. I've gotten a lot of questions about the software I use and recommend. My favorite combination includes Lightroom, Photoshop, and InDesign. But the guide is about so much more than software—it's about the philosophy of building a wedding package with your clients' best interest at heart, ultimately making their lives (and yours) easier. It's about setting up a system so that no one (you or your clients) has the chance to drop the ball and delay the process. And it's about the potent combination of efficiency and effectiveness.